The new Vortex Razor HD binoculars are basically an evolution on their already excellent "standard" Razor binoculars to which Vortex have made improvements in a number of key areas. These include using premium HD glass (High Density) with extra low dispersion properties and the best-quality, hand-selected roof prisms, which according to Vortex means they now produce an even better and brighter image. The body has also changed and is now slightly smaller and lighter and apparently stronger than the older Razors. Manufactured in Japan, the roof prism Vortex Razor HD binoculars have what they call a "True Open Hinge" design. Basically this means that unlike "normal" open hinge binoculars that have two very thin bridges connecting the barrels together with a gap in between them, these just have one slightly thicker one. You may be thinking that this is just like the standard roof prism design and you would be right, but there is a difference - the single hinge/bridge on this Vortex is far thinner and this means that much more of the barrels are left exposed. I really like this as indeed I do the normal open bridge designs as I find it makes them not only more comfortable, but just a bit more secure to hold one handed. For example when walking through thick bush you may use one hand to clear a path and the other to hold onto your bins. Another good example would be when traversing hilly, rocky or other tricky ground it can be somewhat maddening to have your optics swinging around your neck or worse the could get damaged striking a boulder as you scale it. By simply holding onto your bins in one hand, you solve these issues and with this "True Open Hinge" design you can be more confident of a secure grip. Personally, I also really like the shape of the body which I think looks great thanks to this single thin bridge and finally this design also does its bit to decrease the overall weight and bulk of the binocular. 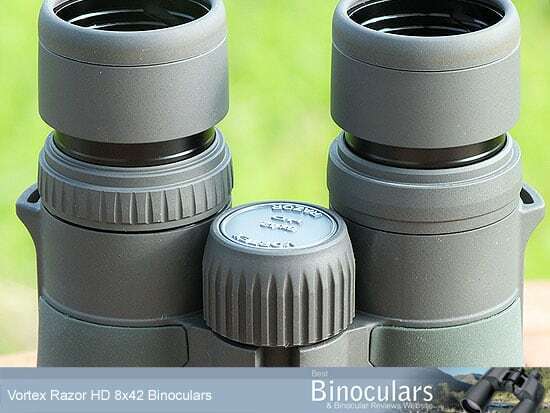 Most of the external part of the binocular is covered with a really thin and very hard dark green rubber armouring, which will help protect your optics from most minor impacts, but possibly not as much as binoculars that have a thicker layer of armouring. Because this covering is so hard and thin, it is also not quite as tactile as on some that I have reviewed, but it does have a very fine texture, almost like sandpaper which really helps produce a very dependable non-slip exterior which I really liked. This covering is also very unreflective, which is imperative if you are trying to stay unnoticed when observing timid birds and other wildlife. The parts that don't have this armour covering include the bridge, a small inset on the insides of each barrel and approximately the last third of each barrel (nearest to the eye pieces). Here the magnesium which is colored a dark grey is left exposed, this creates a nice two tone effect with the dark green armour and I guess helps to keep the optics weight to a minimum. This exposed magnesium has a slightly rough and a very dull finish to it, which once again provides a good non-slip surface and ensures that the body remains as unreflective as possible. One disadvantage of not having the whole body covered in a rubber armour is that it means that there is more chance of them making a louder sound if something like your watch or more commonly a ring on your finger strikes against them. Rubber armour dampens down the sound and helps to ensure that you don't frighten away easily spooked animals like birds or deer. Under each barrel on these Vortex Razor binoculars there is a thumb indent, these are well paced and do just enough to encourage you to hold them in the right position when glassing. Holding them in this position and in my hands, I though that this 8x42 Razor was nicely balanced which helps to keep them nice and steady for a perfectly still image. The importance of this should not be underestimated, as a binocular that is easy to keep still is also far more comfortable and less strenuous on the eyes to use over long periods of time. The objective lenses are set quite deeply within the ends of the barrels (about 8mm), this is another aspect of the design that I like because this will help protect your lenses when the lens caps are removed. As mentioned earlier, the main chassis on this 8x42 Vortex Razor HD is made from magnesium which is not only much lighter than the more commonly used aluminum, but is exceptionally strong and although I never tested them to destruction, they do indeed feel really solid and robust giving you that lovely "feeling of quality". These Vortex binoculars have been made 100% air and watertight with toric joints (seal with an O-shaped cross-section) which stops any sort of dampness from penetrating them. A secondary benefit of having this seal is that is also will not let any dust or other debris to enter the system. On top of this they are "argon purged" which means all the air inside has been removed and had argon put back in its place which pretty much guarantees that the inside glass surfaces won't fog up. This can sometimes happen with very quick temperature fluctuations or lots of humidity. Because the insides are completely moisture free, no corrosion will take place helping to ensure the long life of the instrument. Unlike cheaper optics that use a hard plastic, the twist-up eyecups on these Vortex Razor HD 8x42's look to me like they have been made from a type of metal and covered in rubber for comfort. The ocular lens is bigger than the majority that I have reviewed in this size class and has a diameter of 23mm and the eyecup has an external diameter of 40mm, which is fairly large. This along with the rubber helps to make them sit reasonably comfortably around your eye sockets and I had no problems with comfort even during sustained periods of observation. I found the helicoid mechanism on the actual eyecups worked very well being both simple and smooth to operate. A real plus point to those eyeglass users is that there is 17.5mm of eye-relief which is very good and the eyecups have two preset intermediary stops in-between the extremes which gives you plenty of scope to make sure that your eyes, even with glasses on are at the optimal distance from the ocular lens. Those of us who don't use glasses, will have the eyecups set to the fully opened position to make sure there is no blacking out round the periphery of the view. The chassis of the central focussing wheel looked to me like it was metal which has then had a coating of rubber attached on top of it. There are also grooves in the rubber providing a ice non slip surface. The wheel has a diameter of 30mm which is just about standard for a full sized roof prism binocular. I liked the amount of resistance that wheel had, meaning that focussing was nice and smooth, without being to loose which can sometimes mean you often over rotate the wheel. From the standard grip and in my hands which I would describe as being "average for a man" was comfortable to reach and turn with my index finger without having to change grip. Another point to mention is that because the focus knob is nicely grooved, fairly large and protrudes out from on top of the binoculars it makes controlling it really simple, even with thickly padded gloves on, so ideal for use in winter in very cold climates. The gearing on the Vortex Razor HD focussing mechanism is about average - taking a tiny bit more than 1½ rotations to get from close focus to infinity. What this means that large changes in focusing distance takes more turning of the dial and therefore a little longer than ones that are more aggressively geared (some take only ½ a turn), however the upside is that fine tuning to get the image completely sharp is just that bit easier. 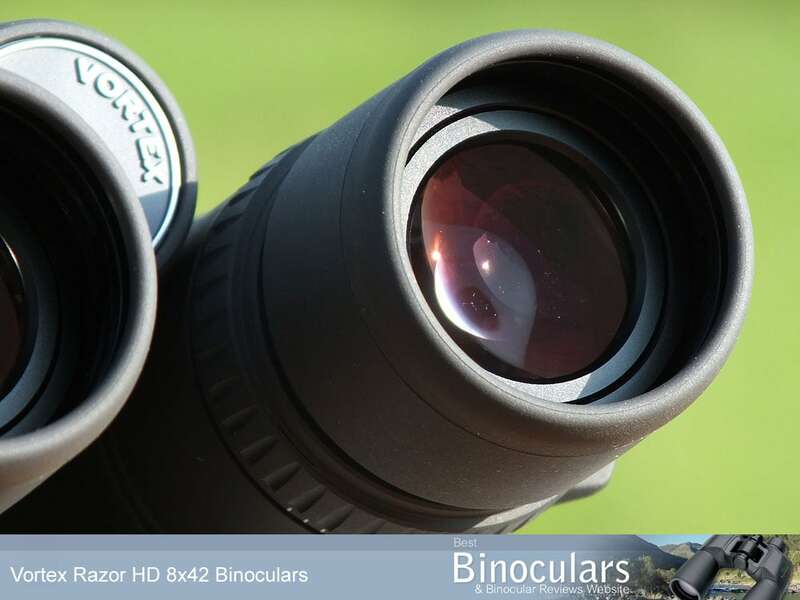 As with all good quality binoculars and to compensate for any differences in your eyes, you can set the focus of one barrel independently of the other using the diopter adjustment. On this Vortex binocular, it is positioned between the eyecup and the chassis on the right side of the binocular. One thing that I really like is that you can secure it in place (to change your setting you need to click it towards the eye-cup before it will rotate) This prevents any accidental movement and unlike the plastic ones you find on many cheaper optics, the diopter ring on these is made from metal with grooves cut into it. As long as a binocular is not overly heavy, its balance is actually usually more important than the weight. However it is nice to have your cake and eat it and not only are they well balanced, but the Razor HD feels really light to hold. Checking on their stats, at 24.2 ounces (686.06 g), these are indeed very light for a pair of full sized 8x42 binoculars. As a point of interest and even though they look and are quite different, they happen to be the same weight as the Vortex 8x42 Viper HD. Note: There are instances where if you just focus your search on very lightweight binoculars can be a mistake. The reason I say this is that some very poor quality materials used to make low quality bins also happen to be very light, but certainly no where near as strong or long lasting. So whilst these Razors are very light, it is not because they use cheap materials, in fact the opposite is true as the main chassis of these is made from magnesium which is not only much lighter than the more commonly used aluminum, but is exceptionally strong. With their eyecups fully retracted, they have a length of 15cm (5.9in), which is their advertised length. Completely twist out the eyecups and it extends their length to 15.8cm (6.2in). Folded (inter-pupillary adjustment set to it's minimum), their width is 10.4cm (4.1in) - fully opened it is 12.9cm (5.1in) which is their advertised width. These dimensions are very good for a full-sized binocular and groups them with the most compact 8x42 binoculars that I have reviewed. In my rather "average" sized hands, holding them was comfortable and they felt perfectly balanced. For me the centrally located focus dial was simple to access and turn without having to change grip. Basically an APO (apochromatic) lens, which usually consists of three elements, brings light of three different frequencies (most often red, green, and blue) to a common focus, the advantage of this is that it has a much better correction of chromatic aberration that causes colour fringing as well as spherical aberration than the much more commonly used achromat lenses. The reason for this is because achromatic lenses are corrected to bring only two wavelengths (usually red and blue) into focus in the same plane and not three as in APO lenses. What is more, Apochromats also correct spherical aberration at two wavelengths of light, rather than just the one as in an achromat. The main reason that you don't find APO lenses in all bins is because they need very specialized optical glasses with special properties. What is more, during the manufacture of the lenses, the designers have to take into account things like the temperature dependence of glass and the liquid index of refraction and dispersion to make sure that their design offers a perfect performance optically over a fairly wide temperature range. So as you can imagine not only is this very costly, but is extremely complicated to produce and requires highly specialized skills and equipment. You can read more on these fantastic lenses in my complete guide to APO (apochromatic) lenses. One of the lens elements in this APO optical system uses premium HD (High Density) ED glass (extra-low dispersion). Some manufacturers use expensive ED glass in some elements of their lenses on their higher spec optics like these Vortex Razor HDs because it has the potential to improve image sharpness and vastly diminish the amount of chromatic aberrations which are seen as color fringing - the better these and other aberrations are regulated the better and higher quality the image will be produced. An ED glass element helps as it allows the creator of an objective lens with more than one element a greater choice when it comes to focusing and directing the light wavelengths. Due to it's high cost and added manufacturing complexity, ED glass is usually reserved for higher end binoculars and other optical devices. Vortex also use High Density (HD) glass in the design. As far as I understand it and I may be wrong here, but a higher density glass is easier to work with and so they are once again better able to manipulate and therefore focus the light wavelengths, thus improving the resolution and color fidelity of the image even more. Glass that is more dense will also not expand or contract as much as with temperature changes than glass that is less dense, this is an important factor as this expansion and contraction can effect the way light travels through the glass and can therefor affect the quality of the image produced. 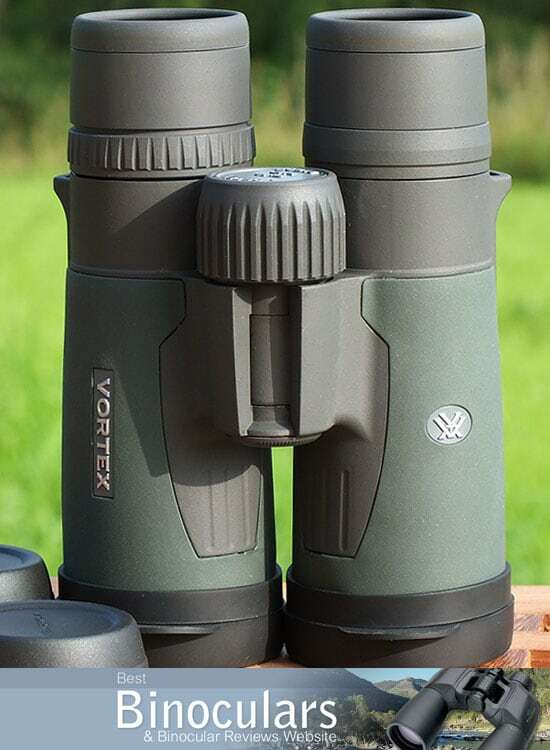 Vortex have added more than one layer of their proprietary XR anti-reflective lens coatings to all the glass surfaces that come into contact with air on these 8x42 Vortex Razor HD binoculars. This has a big effect in improving the light transmittance and thus results in a much brighter image which is obviously important when the available ambient light is poor. The amount and quality of anti-reflective coatings should are very important as here have been many occasions when I have observed a brighter image produced by a binocular with smaller lenses, but higher spec and more anti-reflection coatings. Vortex have also added super-hard coatings that are also resistant to scratching to the exterior of the lenses. These ArmorTek Coatings provide improved protection but also repel dirt and oil, keeping them clean for longer and thus require cleaning far less often and when you do need to clean them, it is far easier which ensures that they remain in perfect condition. What they do not go is what glass they use to make the prisms with and unfortunately I have not been able to find out any more information. My guess based on the quality of all the other components would be that they are probably using something like the good quality BaK-4 glass and almost certainly not BK-7 prisms that is found on lower end binoculars. One of the negatives to using a roof prism in your optics is that you get "phase shift" occurring when the light waves are reflected at the opposite faces of the prism, the result is a small loss in sharpness. Very high specification roof prism binoculars like this Vortex Razor HD combat phase shift by applying phase correction coatings onto the prism which preserves the light in the right color phases. Binocular with this coating thus deliver better contrasting images with superior resolution and enhanced colors. The one downside to the roof prisms design is that the first prism in the roof prism system has one surface that does not feature total internal reflection, this results in the loss of some light. 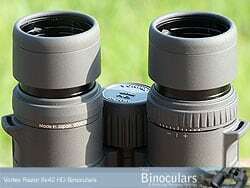 Therefore it is very important for a binoculars' optical performance to raise the reflectivity of this surface. To do this single or even multi-layer coatings are sometimes used on the surface to raise it's reflectivity. On lower quality roof prism optics, an aluminum mirror coating is used due to its low cost and fairly high reflectivity of between 87% to 93%. A silver mirror coating is used when a higher reflectivity (reflectivity of 95% to 98%) is desired and the benefits outweigh the increase in cost. The practice of forming high reflectivity optical coatings with silver also takes substantially more effort than with aluminum, in part because of specific material problems that arise from the aggregated structure of depositing thin metallic films. However light transmission of the prism can be improved even further and on the very best, like these Vortex Razor HD binoculars, manufacturers go even further by using a dielectric coating rather than a metallic mirror coating. 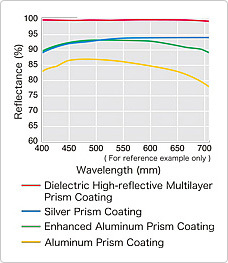 This causes the prism surface to act as a dielectric mirror and a well-designed dielectric coating can provide a reflectivity of more than 99% across the visible light spectrum meaning that they have better light transmission (brighter images) and excellent color fidelity for the clearest, brightest, most color-accurate images possible. The width of the image that you see at 1000 yards is 388 feet wide (129m @ 1000m) or 7.4°, therefore I would describe the field of view through the Vortex Razor HD binoculars as very good and well above average but not quite chart topping. The nearest point that you can focus on with these 8x42 Vortex binoculars is exactly 6 feet (1.83m) away which is excellent for a full sized standard binocular and ideal if you intermittently enjoy observing butterflies and other nearby objects. Their maximum eye-relief of 17.5 mm is also very good and should be more than enough for most eye-glass users. It also means that they make it onto my list of binoculars with long eye-relief. 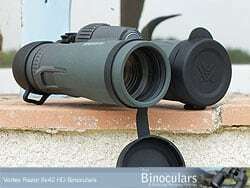 For more on this, take a look at my section on the eyecups for these Vortex Razor HD 8x42 binoculars. The following tests on this Vortex Razor HD binoculars were conducted at sunrise, again later on in the day in good light and again at and just after sunset. The ability for your binoculars to gather as much light as possible is very desirable, especially if often used in poor light, for example when birding or observing wildlife in thick forests or when the sun is low in the sky. 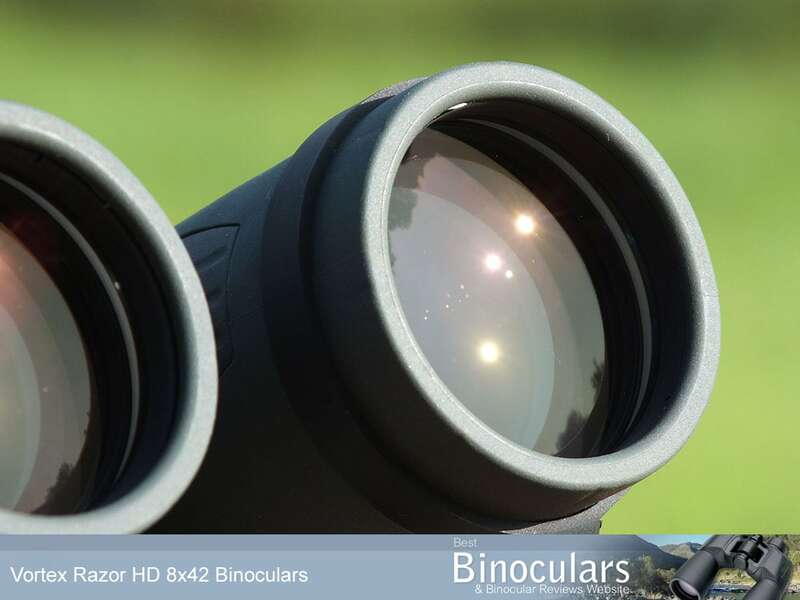 These Razors and all other 8x42 binoculars have an Exit Pupil of 5.25 as well as a Twilight Factor of 18.3, which both imply that they should function well in fairly poor light conditions, but remember this is just a rough guide. I say this because your binoculars could gather all the light in the world, but if it is not transmitted to you eyes, it is pointless. So as well as the magnification and objective lens size, the image brightness and their low light performance depends greatly on the quality of the optical system and the coatings used. I have read that they can in some cases double the quantity of light that comes out of the ocular lens and into your eyes. As we have already discovered, these Vortex Razor HDs use very high quality glass and coatings that contribute to them transmitting more light to your eyes and therefore produce a brighter image than inferior binoculars of the same configuration. Having properly focussed on something and as you would expect, the image is pin sharp. The image and it's colors felt very natural to me which is a good thing and nothing like the false hues that I have sometimes observed on inferior products. I thought that the contrast between dark areas lighter ones was also very good, which can really help in defining the depth of an image. To judge the depth of field, I first focus on an object and then see how far back I can go beyond that object and still have what I am looking at in focus (without touching the focussing wheel). These were about the same as my control, which gives them an overall depth of field rating for a binocular with an 8x magnification of of very good. To check for signs of chromatic aberration, I focus on light coloured and white objects sitting in front of dark backgrounds as this is where it is easiest to note if there is any color fringing along the objects edges. To my eyes there was no visible colour fringing on these Vortex Razors and I would say that this is where the apochromatic lenses and ED glass on these really makes a difference as you can notice the improvement when compared to my controls that don't used ED glass. On a poor quality device, you often get a noticeable amount of image softening right at the edge of the viewed image. The amount on these Vortex binoculars was extremely minimal, in fact it was approaching zero, which is a big improvement on my control which means, they are rank with the very best in this sector. Overall and to sum up the image quality, I rate the view through these 8x42 Vortex Razor HDs as excellent and easily on a par or better than any I have ever used. The table below evaluates some of the main features and specs of this Vortex Razor HD with that of similar sized roof prism binoculars - including the premium Swarovski 8.5x42 EL's, the mid to high value Minox HG 8x43 Binoculars, Kowa BD 8x42, Eagle Optics Ranger ED 8x42, Celestron Granite 8x42 and the Vortex Viper HD 8x42. 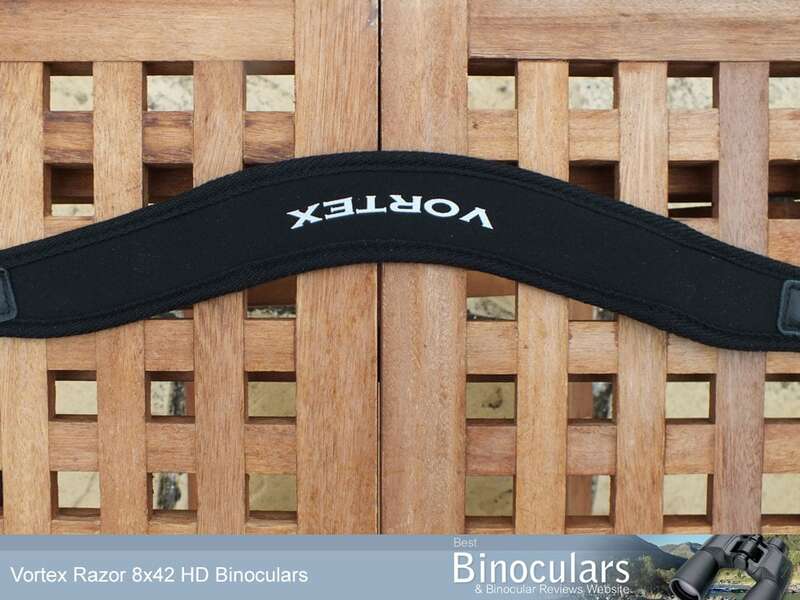 These Vortex 8x42 Razor HD binocular comes with an excellent neck strap. The part that wraps around your neck has a good amount of padding and is also wide enough to spread out the load over a larger area. It is also shaped to fit better around your neck and shoulders, which once again increases comfort. I really like the looped connectors between the nylon straps and the padded neck section that ensure that the neck section of the strap is not disturbed or moved when you lift the binoculars up to your face from your chest. This is a minor point, but really does show a very good attention to detail. 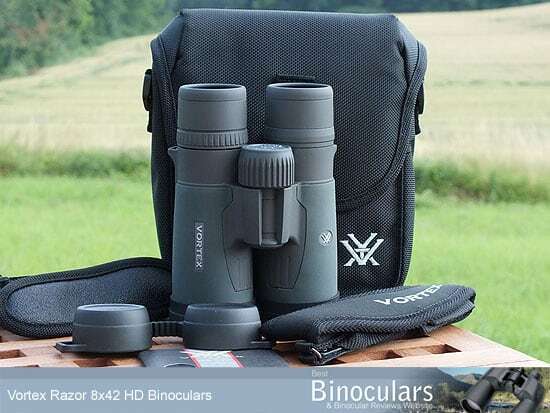 The Vortex Razor HD come with a pretty well padded soft carry case which the binoculars fit securely enough to be well protected, but too securely that would make accessing them tricky. Access to the inside is via a large flapped lid that is held securely closed with a quick release buckle and strap. 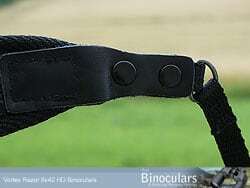 The length of this strap can be adjusted which means you can ensure that the binoculars fit properly even if their eyecups are fully retracted. This really small thing may sound obvious, but there are plenty of bino-bags out there that won't close unless you put back your eye-cups which I find time consuming and rather annoying. On the inside of the lid there is also a separate meshed zipped pocket that is ideal for storing a few small personal items and your lens cleaning cloth. The carry case has its own strap which dos not have padding. This strap can be quickly attached or taken off the bag with quick release clips. If you remove this strap, it allows you to thread the binoculars neck strap through the sides of the bag and the lid and use it to carry the bag and binoculars instead. On the rear of the case there are a couple of loops that also enable you to thread the case through your belt to carry your binoculars on your hip if you prefer. Overall the case looks to be pretty well made and as I have already discussed, functions very well and has everything you need from a carry case, but being very picky, it is possibly not quite as luxurious as some I have seen that come with binoculars in this price range. The rain guard or eye-piece cover is made from what looks like a hard rubber or possibly a soft plastic. On the pair I tested, the fit onto the eye-pieces was perfect and thus were not liable to come away by mistake. The rain guard also has a flexible connector linking the eyecups which either expands or compresses according to your inter-pupillary setting. Shamefully this is something that does gets ignored and thus unless you fully open your binoculars, the guard does not fit. This becomes very annoying having to adjust your bins after evert time they are used. The objective lens caps fit well over the ends of the bins and so should not come away accidentally. They are made from what looks and feels like a soft rubber and I like the rubber loop that keeps them hitched to the barrels, letting you hang them down out of the way when you are glassing as this prevents someone like me from loosing or misplacing them them. If you don't like your lens covers attached and hanging down when not in use, you can simply remove them, remembering to stow them somewhere safe like the carry bag. I also really like the fact that the objective lenses are set quite deeply within the body (about 8mm) - which will help protect them when the lens caps are removed. Inside the case you will also find a really good cleaning cloth that is protected and kept clean in its own cardboard sleeve. Also included is a basic instruction leaflet that includes basic information like the different parts of the device, attaching the strap, setting the eyecups, inter-pupillary settings, focusing as well as cleaning and caring for your lenses. Within the instructions you can also find the details of the "VIP Warranty", which states in basic terms that in the event your Razor HD binocular becomes damaged or defective, Vortex Optics will repair or replace the binocular at no charge to you, which is as good as it gets. These Vortex Razors have a cap located on the front face of the central hinge which you can unscrew. Once removed, you can then screw in a standard ¼-inch threaded tripod adapter designed for binoculars (not included). This adapter can then be fixed to a tripod. Strong Points: Vortex make use of the best coatings and optical components that includes high density ED glass lens elements and dielectric and phase correction coatings on the roof prisms contribute to producing an extremely high quality and bright image. 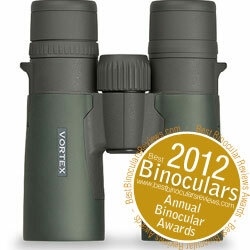 These Vortex binoculars have an excellent minimum focussing distance and they have a very good amount of eye-relief. The water and fog proof body is nice and light as well as strong thanks to a magnesium chassis and I also really like the exterior design that is both comfortable and secure to hold. Also notable and a definite strong point is the overall feeling of quality and the high attention to the little details like a lockable diopter ring, that all add up to make a difference. Weak points? 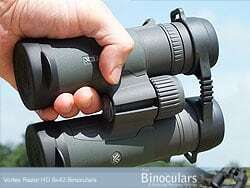 To be honest and as you would expect for a high end binocular in this price range, there are not many weak points. I guess there may be some people who may want for a wider view, but not if it meant that this was to compromise the quality of the overall image, which is often the case on optics with very wide FOVs which have quite a bit of softening around the edges of the image. Being very, very critical - even though the carry case looks to be well made, functions very well as well as having and doing everything you need from a carry case, it is possibly not quite as luxurious as some I have seen that come with binoculars in this price range. 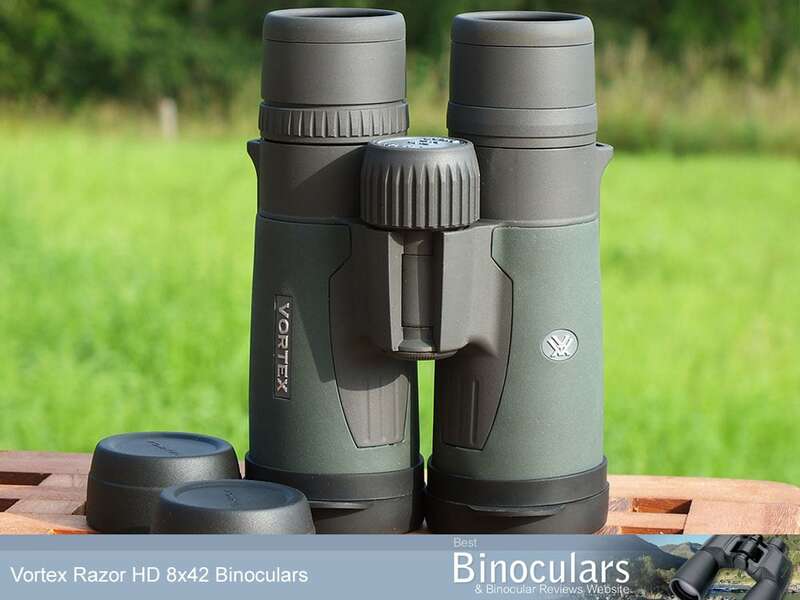 Ideal Uses: As with most 8x42 binoculars these make perfect general use and ideal birding binoculars as they offer the perfect compromise between image resolution and field of view. The 42mm objectives are also big enough to take in plenty of light but don't give rise to a device that is too big and heavy to easily carry about all day long. These Vortex binoculars would also be perfect for most types of wildlife surveillance and very good hunting binoculars especially when you consider that they are also tough, fog & waterproof and will easily take as much of the bad weather as you can handle! Because of their good close focus, I would also suggest them to anyone after a full size binocular that occasionally likes viewing objects from close range for example: butterflies, flowers, dragonflies and other insects. However if this is your main interest, check out my section on Butterfly Binoculars where I recommend some binoculars with a very short minimum focussing distance. If size and weight are not critical to you, these 8x42 binoculars would be perfect for safaris or any wildlife adventure. Likewise for most sporting events outdoors, but it may also be worth considering mid-sized or even compacts that are more convenient to stow away in your bag or luggage until needed. Yes! - My definition of a good value for money binocular is one that gives you the most features, best quality components and the best image quality for the least amount of money possible. However, "Good value" is related to what you perceive to be a reasonable amount of money, so Bill Gates, may look at something as being good value a little differently to me. So what I do is place my binoculars within price categories and then look for the ones that perform the best within that class. This way you can spot the best value for money binoculars within each price category. These Vortex Razor HD binoculars are placed in my high price category (approx: $500-$1200 / £500-£1200) and as such they need to score at least 87% on the Best Binocular Reviews Ratings scale to be considered as good value, which as you can see below, they easily manage, thus they are in my opinion great value for money in their class. Overall I loved using the 8x42 Vortex Razor HD binoculars, they are an exceptional pair of binoculars and as you can see by their scores, I rate them with the very best binoculars that I have ever reviewed and should easily make it onto the shortlist of anyone looking for the best quality high end binoculars.